I’ve never paid much attention to my blog “anniversary” before, but there’s always a first time for everything! I can’t believe I’ve been doing this for four years now. Some days I still feel like the new kid on the block (and I am compared to some bloggers). 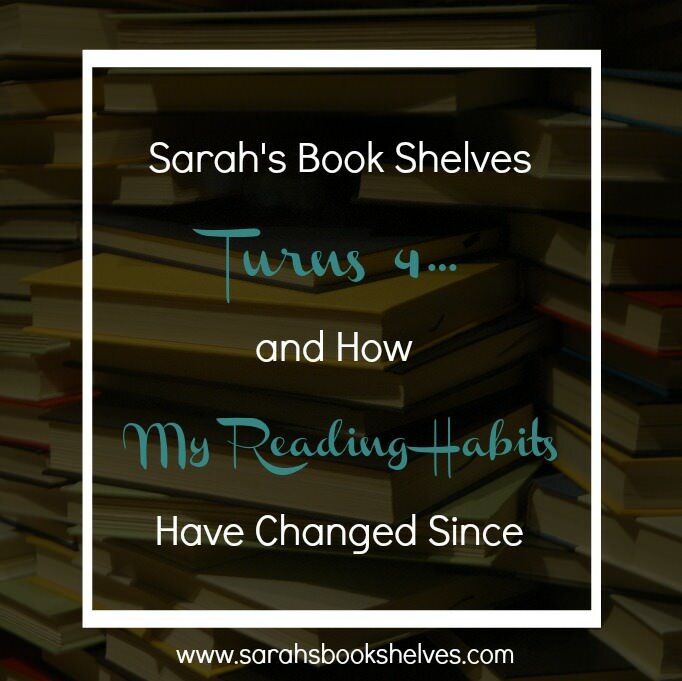 I’ve been reflecting lately on how my reading taste and habits have changed since starting this blog and thought the anniversary of Sarah’s Book Shelves was an appropriate time to share how becoming immersed in the book world has broadened my horizons considerably…making my reading habits fairly unrecognizable compared to my pre-blogging days. I never anticipated how much I would enjoy being a part of the book world, talking and writing about books, interacting with so many fellow reading nerds, recommending the right book to the right people at the right time, thinking creatively about where to take the blog next, and helping all of you solve your book and reading problems! Thank you all for hanging with me all this time! I’m now willing to give most any type of book a try. I’ve added short stories to my repertoire and have had some successful forays into dystopian (Station Eleven , my review) and science fiction (The Martian , Dark Matter ). I’ve also ventured into more esoteric literary fiction that I never would have touched before starting this blog and become more aware of reading stories that are different from my own life. A book’s style has become more important to me at the expense of plot. Nothing feels better than realizing a book’s style is for you within the first few pages. But, on the flip side, it’s harder to use publisher’s blurbs (which are generally focused on plot) to predict which books you will connect with. The buzz surrounding a hotly anticipated new release is intoxicating. And it’s fun to be in the know about all the shiny, new books (and to be able to recommend them to people). But, it also means I’m reading less backlist than I used to. I’m working on finding a balance that includes lots of new releases, but also leaves room for backlist books (putting those backlist books on hold at the library is helping!). I’m a “check-the-box” kind of girl, so prior to blogging I finished every single book I started. What a waste of time this was! I wish I could go back and start DNFing books years earlier. There are just too many great books out there to waste time on books that aren’t satisfying you in some way. I used to love those massive chunksters that can double as doorstops (I even have a whole recommendation list devoted to them). I didn’t care if it took me a month to read one book. Now I feel like I’m missing out on so many other books by devoting that much time to just one. It has to really knock my socks off to be worth it. The last book that did that was A Little Life (my review). I’m not just reading for me anymore. I’m constantly thinking about who else might like the book I’m reading and what other books are similar to it. This shift in thinking recently led to a list of Books That Aren’t For Everyone…But WERE For Me. If I have a free minute (and I mean a literal minute), I try to pull out my Kindle. While stretching at the gym, while waiting in line at the grocery store, if I’m a few minutes early to pick my children up from school, etc. How have your reading habits changed over time? First of all, happy blogversary to you! I remember when I first connected with other readers over the ‘World Wide Web’ or whatever it was called so many years ago. I was so delighted to find others that were like me – readers. Since that time, my bookish side has expanded and changed in many ways. It’s fun to find your ‘people’! Thank you! And I hear you on blogging expanding our bookish sides. Mine too and probably to the point beyond what my real life friends find tolerable…haha! Four years! Congratulations. I admire how you’re always looking for new ways to present things and keeping your blog fresh! It was really interesting to hear how your reading habits have changed. I can see myself heading toward some of those changes. (Like not wanting to read the crazy long books anymore.) I’ve been in the DNF camp for years, but think I still need to start raising the bar in that area. Becoming a part of the book world and the book blogging community has been the most pleasant surprise for me, too! You particularly have been so welcoming. Hope you pop a bottle of champagne or at least have a few drinks to celebrate your 4th!! Happy blogiversary! So glad we connected during nonfiction November! Happy blogiversary! I love your blog. I’m trying to get better at DNFing. I’ve already DNFed 3 books this year. That’s more than I DNFed last year. Wow! 4 years that’s fantastic! I’m new to the blogging world and have really enjoyed reaching out to the blogging community. You are one of my favorite blogs to read. Happy anniversary! I agree with everything you wrote. My reading seems to have come full circle; I’m reading more new releases, but I’m also back to reading the types of books that made me fall in love with reading. I love how you’ve listed how your habits have changed. I almost feel like I’ve grown in so many ways, with regards to books, since blogging. I feel like I let the excitement get the best of me for a bit, but sort of had to go through that to gain the perspective I needed to find a better balance. Maybe similar for you? Very similar for me. I feel like I’m still trying to find balance, though. I have so many goals and things I want to write about outside of books, but I’m having to ease into it. I do feel better every year about blogging, as though I’ve overcome some sort of obstacle from the previous year. Yay – thrilled to hear that and to see what else you’re going to write about! Happy anniversary! You’ve made such a big impact in a (relatively) short amount of time! I love being able to recommend the right book at the right time! It might be my favourite thing about being a book blogger. I didn’t realize it until you said it, but I totally read for other people now, thinking about who will like this book, who won’t. Actually everything you mention on this list is true for me too. This must be why you’re always able to recommend books that I love. And it’s like a weird kind of rush, right?! We probably shouldn’t tell too many people that. Would probably out us as HUGE nerds – ha! I’ve also noticed some of the same changes you have between pre-blog and blog. The biggest thing for me, though, about the way I read, is that I find I think a lot more about what I’m reading. Which I love! The other big difference is that having other readers to ‘talk’ to about the books makes me want to read even more! Which is good, but comes with its own challenges, like the giant tbr – it’s WAY bigger than it used to be. Thank you! And – yes – I’ve started thinking a lot more too…and taking notes. Which has also led to the noticing of patterns in my reading tastes, which I like. And so true about having people to talk books with! I talk books with some of my real life friends too, but generally people have a certain appetite for book talk and then want to move on to something else…usually way before I do…ha! Congratulations on four wonderful years! I think the biggest change for me is that I’ve found many books and authors that I wouldn’t have discovered on my own. Though I think my tastes have remained pretty constant, they’ve expanded somewhat and I’ve been less likely to stick with the safe and familiar. I’ve been encouraged by multiple rave reviews from bloggers to pick up books that initially didn’t seem to be for me – Station Eleven is one example. Like Naomi, I also find that I’m thinking more about what I read and how I will explain my experience to others. I don’t feel that I need to do this with every book (thank goodness), but when something piques my interest it’s a fascinating challenge to try to put it into words. Thank you! And I’m with you on thinking about how I’ll explain my reading experience to others. I certainly never considered that before blogging and it’s always a challenge to find new and fresh ways to talk about awesome books. Happy blogiversary! Four years is amazing! I’ve experienced the first three things you talked about as well. I’m really happy with how much my reading life has grown and expanded. I’m exposed to books way outside of my comfort zone on a regular basis and it feels great. I’ve discovered so many amazing authors and books that way. And I’m FAR more focused on the quality of writing than I used to be. I’m still terrible at DNFing books that aren’t working for me though. I tend to slog through to the end, even if it takes me an age and a day. I identify with your point about reading with an eye toward recommending books as well. I think sometimes that influences the books I choose to read more than I think. Thank you! And I’m going to try to bring you over to the dark side on DNFing…it’s been such a great thing for me! It’s also opened the door for me to take more reading risks b/c I know I don’t have to follow through if the risk doesn’t pan out. My concern is that if I give myself permission to DNF a book, I will a) give up on books because I have a short attention span and get bored fast, not because they’re bad, and b) miss out on being able to review books that I don’t necessarily like but could spark some interesting discussion. I’m still really ambivalent about the whole idea. Both really good points. I do end up reviewing books I don’t like…especially if the book isn’t necessarily hard to read, I just don’t like it. Books that are hard to read AND I don’t like them end up in the DNF pile. I do mention my DNFs on the blog, though..in my Monday reading updates. I can see DNFing a book if it’s unenjoyable and a difficult read. I probably should have DNFed The Wangs vs. the World last year. That’s the only one I can think of that was really tedious. Congrats on four years! I love this blog and get everything I read from you! Hope you are well friend! Awh, thanks so much, Lynne! I hope all is well with ya’ll and that we’ll get to see ya’ll sometime in the not too distant future! HAPPY ANNIVERSARY, Sarah! I truly wish that I could remember how I found your blog; it wasn’t long after I started blogging, in May 2014, because yours was the first book blog that I began reading each day. I think that’s so fascinating! I’m not sure how I would find appropriate books now, without your help and that of other bloggers I’ve come to know (also thanks to you! ); trying to find books that I would enjoy was a huge reason for starting my own blog, and it’s what keeps me coming back to it. Thanks so much for sharing this and for your support! Awh – thank you, Tara! And yours was the first running blog I started reading! I have no idea how I came across your blog either, but I remember being thrilled to find a blog that combined 2 of my hobbies!! And – bonus that our reading tastes are so similar! Happy Blogoversary! I love the idea for this post. My reading habits have definitely changed over the years. May I borrow the idea? Congrats on 4 yrs! The milestones are always worth celebrating – they’re a nice pause for reflection. I’ve just hit 1000 blog posts which I felt was worth celebrating too. The main thing that has change in my reading habits is the reread. Beginning blogging also coincided with starting a job in an Indy bookshop, so they both have played a part in my lack of rereading time. I used to love the reread, but I now find it hard to justify the time in reading something I already know and love when there are so many new, shiny books at my disposal every day! I’m actually trying to change that this year. Congrats on 1,000 posts! I wonder how many I’ve done…I have no idea! And I should have put re-reading on my list – I definitely don’t do that anymore. I think I’ve become more aware of all the great books out there and always have a list a mile long of new stuff I want to try, so re-reading has fallen way down the list. Happy Blogaversary! Thanks to you, I have had really great luck with books! And thanks to you, I don’t feel as guilty about DNFing a book…. Thank you and double count of yay! Happy blogoversary! Yay for 4 years! And I agree- blogging has certainly expanded my reading horizons as well, and I love it. So many books I never would have tried. And I definitely am more plugged into bookish trends, new releases, and genres I otherwise wouldn’t have considered. It’s pretty awesome actually! Anyway congrats again! Happy anniversary! I’m so glad we ‘met’ and are reading twins and vetting partners! Thank you for so many great recommendations. Like you, I never used to DNF. I felt I owed it to the author to at least finish the work. Not anymore. Sadly (or not), I used to be less critical. I would let OK books slide, and sometimes i still do, but only when reading for pleasure. If it’s for my blog then I’m harder on the book. And I can’t imagine reading without you now!! Congratulations on your blogging success! I started at almost the same time as you, four years ago in April. I’m glad you still enjoy it, as I do as well. Reflecting on the changes blogging has brought is a good thing. Thanks for sharing your thoughts and best wishes for the future! I didn’t realize we started at the same time! Happy 4 yrs to you as well! I think my reading habits changed because of blogging, mostly with reading young adult books, which is now one of my favorite genres. I still stick mostly to my preferred genre: crime fiction, but I do wander outside once in a while. As for DNFs, I’ve never understood “having to” finish a book. This month, I’ve given up on 10 books already and I’m alright with that. Good for you on the DNFing – wish I’d started that much earlier in life! I’m with you on the DNF-ing!! It’s difficult for people like us who want to mark something DONE! But it’s sooo worth it when you realize you are wasting your time and could be reading something WAY better with it. I never used to DNF, either, but I guess we’ve both learned there are FAR too many good books to try out there! And certainly not every book is going to speak to every reader. And, CONGRATS on 4 years!! And I think what put me over the edge on DNFing was a heightened awareness of the opportunity cost of sticking with books that aren’t working for me. congrats to you! my reading habits have changed soooo much! and i’m glad for that. I used to just pick up whatever random Nicholas Sparks book i can find. Now I have actually found (and now know) what I like. It makes reading so much more enjoyable for me. My reading habits have changed as well since I started book blogging (I can’t even remember how long it has been). I’m going through another “change period” right now, which I think I’ve been subconsciously trying to resist, but am now embracing. Happy blogoversary. The biggest changes in reading habits for me are (1) technical — still adjusting to eReading and (2) jumping into the middle of series. I used to be such a stickler about series. Now I just read. Happy blog birthday!! I’ve noticed some of the same changes in my reading habits too 🙂 I’m not sure I’m quite as willing as I should be to DNF books yet, but I do it a little more and I’m definitely less willing to commit to reading a chunkster. I’m not sure if my appreciation for plot vs writing style has changed, but I also love when I know a book is going to be a good fit for me within a few pages. Thank you and isn’t knowing immediately (and ending up being right) the best feeling? !